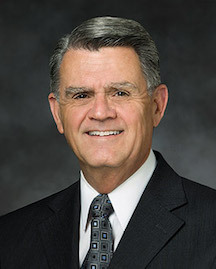 Gary J. Coleman is a General Authority of The Church of Jesus Christ of Latter-day Saints. He was called to the Second Quorum of the Seventy on June 6, 1992, and served there until April 5, 1997, when he was transferred to the First Quorum of the Seventy. He was designated emeritus status on October 1, 2011. Coleman was born on September 18, 1941, in Wenatchee, Washington, and grew up on a farm in Bridgeport. He was reared as a Roman Catholic and had intended on being a priest. His parents gave him the middle name of Jerome after the Catholic saint who translated the Bible. His introduction to the LDS Church came when a fellow student at Washington State University invited him to attend an early morning Seminary class he was teaching. That friend, John M. Madsen had the privilege of baptizing Coleman a few months later in November 1962. Eight months later he married Judith Renee England, another member of the Church. They are the parents of six children. Coleman earned his bachelor’s degree from Washington State University and went on to obtain both his master’s and doctorate degrees from Brigham Young University. He taught in the Church Educational System and served as the assistant director of the Institute of Religion adjacent to Weber State University. He presided over the California Arcadia Mission and has been a bishop and counselor to both stake and mission presidents. This page was last edited on 1 May 2017, at 16:13.